Last weekend I went to Bandung for a day trip with my family. It was just a one-day trip, leaving Jakarta early in the morning and arrived in Jakarta again around 9 o'clock at night. And then the next day (Saturday) I had another family weekend mini getaway, staying at a hotel downtown with my husband's family. I had very little sleep because we went out early on Friday, arrived late at night at the same day, and then had to wake up early again on Saturday morning, slept late that night at the hotel, and then woke up really early again on Sunday morning to have breakfast together. So all those lack of sleep makes my eyes really puffy and looking very tired at the end of the day. 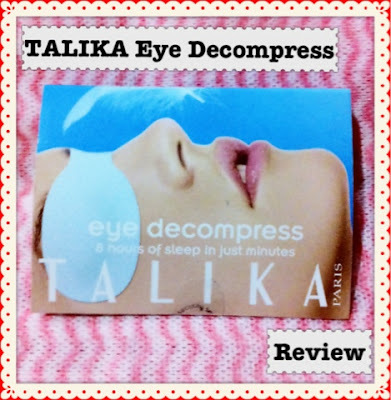 And that's when I decided to try the Talika Eye Decompress that was sitting on my work table. I mean, it's the perfect time to try it out, right? Because it claimed to make our tired eyes looked like we just had an 8 hours of sleep in just minutes! 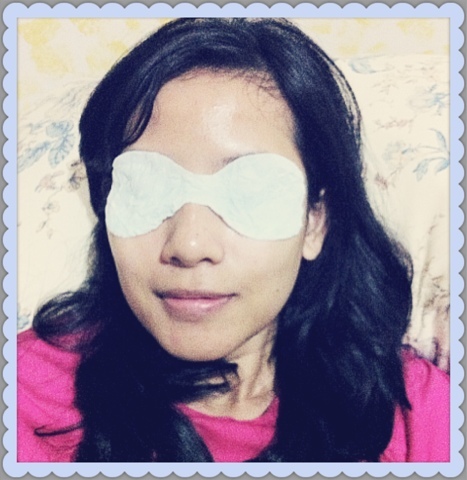 "Eye Decompress, Only 10 minutes anytime, anywhere, instant tablet for soothing those tired eyes. Just immense this incredible tablet and it instantly transform into an eye mask that refreshes and reduces swelling around the eyes while soothing and calming tired eyes. It removes dark circles and puffiness around the eyes and smooths and soothes eyelids. Instant sensation of refreshed well-being." "Eye Decompress adalah masker mata instan untuk menyegarkan mata yang tampak lelah. Cocok digunakan saat traveling atau untuk mata lelah akibat kerja lembur. Mengandung bahan alami cornflower extract yang mempunyai aroma segar & menenangkan"
"Eye Decompress is an instant eye mask to refresh tired-looking eyes. Suitable for use when traveling or for eyes tired from working overtime. Contains natural Cornflower extracts that have a fresh and soothing aroma" . I got this Eye Decompress from the Talika event a while ago so I don't know whether this packaging is the one that you will find at the store or is it a sample packaging. 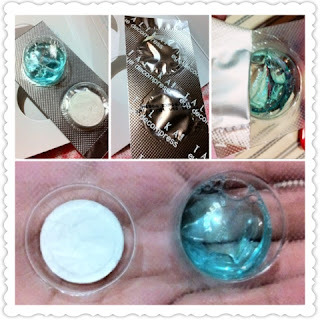 Inside the folded packaging there are two small compartments that are tightly sealed, one of them is a clear blue water solution, and the other one is a white pastille form. 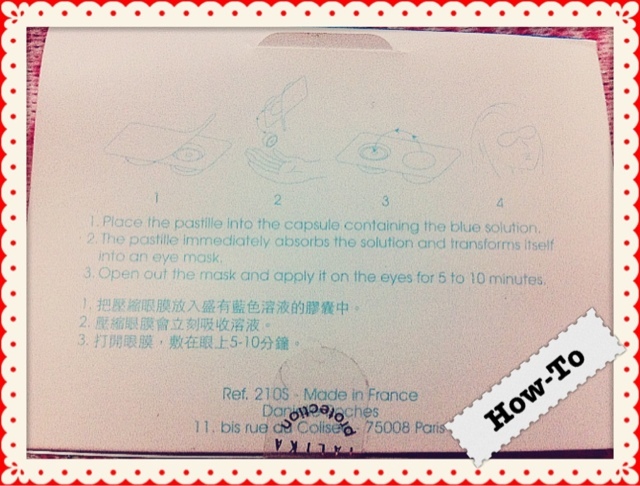 - Open the sealed compartments and place the white pastille into the blue solution. 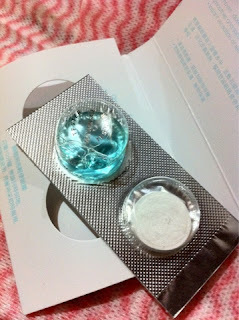 - The pastille would immediately absorbs the solution and transforms itself into an eye mask. - Open out the mask and apply it on the eyes for 5 to 10 minutes. The size is perfect for the eyes area, and when I put it on it felt breezy and very refreshing. Although it was dipped into a water solution but it didn't feel wet at all. It feels damp but not watery. It is very soft and relaxing on the eyes. I put it on for 10 minutes as suggested, and within those 10 minutes it gradually gives me a bit of cooling sensation -which I love (! )- because it instantly gives your eyes that rejuvenating and refreshing feeling. When I took it off after 10 minutes I see some difference in my eyes. 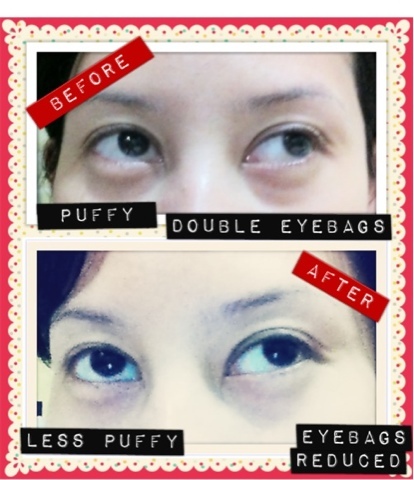 My tired looking deep eye-bags were reduced and the puffiness were also slightly reduced. My overall complexion also looks more refreshed because of that. Overall, this Eye Decompress is suitable for those times when you had "lack of sleep before the big event". Or for those moments where your eyes are incredibly tired and really puffy. The small and compact size of this Eye Decompress makes it really easy to carry on your makeup bag. It's fast to use and hassle-free too. 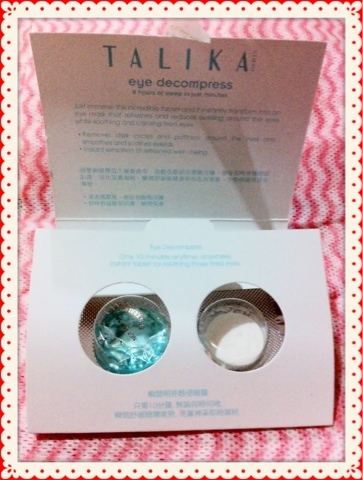 This Eye Decompress costs IDR 330,000 (for 9 x 3ml) >> around $30. In Indonesia you can find Talika in Metro Plaza Senayan and Metro Pondok Indah Mall. Oh I would love to try this! *hope i can try it someday..
Had no idea what is and how to use...well now I can't wait to try it!